Choose from one of three programs that will support the completion of the following merit badges: American Cultures, Virginia Indians or American Heritage. 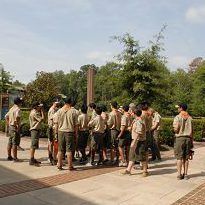 American Cultures – Through an interactive guided tour at Jamestown Settlement, Scouts are introduced to the Powhatan Indians, English Settlers and West Central Africans. Discover how the ideas and knowledge of these 3 cultures impact, both positive and negative, each other. This tour meets requirements of the American Cultures merit badge. Virginia Indians – Explore the culture and technology of the Powhatan Indians at Jamestown Settlement! Test your skills at fire-starting as you work together in the recreated Powhatan Indian Village. This tour meets requirements of the Indian Lore merit badge. American Heritage – At the American Revolution Museum at Yorktown, explore our nation’s founding documents and learn about the choices people made and the challenges they faced throughout the Revolution. This tour meets requirements of the American Heritage merit badge. Consult Group Admission Rates, Field Trip Planning Made Easy and the Teacher Checklist to prepare for your visit.